Chirality is a state of not being able to superimpose over its own mirror image. Anything can be chiral, as long as it is asymmetrical along more than one dimension. Different forms of chirality can be confirmed and used to prove the existence of at least three spacial dimensions.Underlying all of physics is chirality. Without context to anything but itself, there is a universal direction to every dimension. Asymmetry is found everywhere in the natural world. Quantum physics is riddled with asymmetries like the noteworthy fact that neutrinos all spin the same direction. The most common usage of the word chirality is in chemistry, where some molecules can’t be superimposed on their own mirror images. Chiral molecules have more complex properties and can often only operate in cellular life in a narrow context, making them trustworthy and predictable. Because we function in three-dimensional space, objects must have chirality along multiple axises in order to be truly chiral. Most things easily fulfill that caveat but the official definition is slightly flawed in light of three dimensions. Often, the definition mentions a mirror image that can’t be superimposed but if something were only a mirror image it could be flipped in a third dimension and once again be superimposable. People use the example of left and right hands to describe chirality but that example works because hands have a palm and a back, in addition to mirroring left and right. That said, the etymology of the word chirality is derived from the Greek word for hand. Snail shells, spiral galaxies, and the DNA helix are must have more than one axis of asymmetry to be truly chiral. 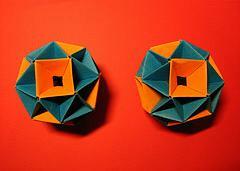 Another way of saying this is that chiral objects or systems have no symmetrical center in any dimension. These origami structures are worth a thousand words. They possess opposite chirality. No matter which way they are turned, the pattern will never twist in the same direction for both objects, yet they are in pattern, ratio, color and mass identical. Many, many molecules are chiral. Whether it is found in nature, synthesized by the human body or created in a lab, a lot of effective, powerful drugs can be analyzed and synthesized with the opposite chirality, creating often times similar drug effects – under a brand new copyright. Drug manufacturers can often times remarket a similar or even better drug without worrying about generic drugs. There are several ways which chirality manifests in particle physics. Neutrinos only spin left~! 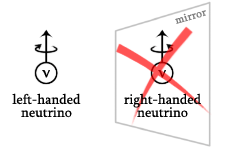 Well, “left” isn’t exactly the right word but neutrinos posses a chirality of shape and then only spin in one directions relative to that shape – the only object in the known universe to spin this way. Neutrinos are hard to come by, and usually found as stand alone particles when emitted via radioactive decay or a nuclear reaction, such as the sun. There may be an anti enutrino particle that spins the other way but it has not been discovered. Neutrinos are only affected by the weak subatomic force, and pass freely through matter.